With only one outing together as a crew before this race, we knew we were slightly up against it to produce our best performance, but given that most of the crew have a fair amount of experience of rowing this stretch of river we were at least familiar with the course which undoubtedly helped us through the race. Boating from Walbrook meant that we had the entire length of the course to warm up, though this was somewhat to our cost as a cruiser went past and half filled our boat with water! Thankfully we managed to bail most of the water out during marshalling and were ready to go, only to be held up by an incompetent Vesta crew two boats ahead of us. Once they had eventually set off ahead, we were underway, really flying past the marshalled boats and settling comfortably onto our race rhythm. As a result of the lack of training time together, our race plan was to slightly under-rate what we are used to for most of the course before raising the rate towards the end to ensure we kept the pace up throughout the race. This was working well for us through the first couple of kilometres, as we chewed up the distance to the crews in front of us such that coming past Raven’s Ait we were overlapping the KRC crew ahead of us, and after a brief bit of resistance from them, we pulled clear coming past the end of the island. Ahead of that, Vesta had taken an illegal shortcut around the other side of the island, giving them an extra bit of distance on us, but we were still reeling them in. Unfortunately for us, we couldn’t quite make the overtake before the bridges, so with between half and three-quarters of a length of overlap and preparing for our final sprint we were told to easy by the umpires as overtaking isn’t allowed through the bridges. This was incredibly frustrating for us as it lost us a huge chunk of time, and due to the relatively short distance between the bridges, we were again forced to easy just before the railway bridge, losing another chunk of time as we waited for them to clear the bridge. At this point, frustration that we hadn’t been able to put in our push for the finish as early as we’d have liked was evident in the aggression shown as we restarted and quickly were straight back up on the Vesta crew which had caused us so many problems, overtaking them comfortably before the finish. We crossed the line in a time of 15:35, though realistically it would have been a lot faster if we had not had to stop twice! All in all it was a good race for a scratch crew and with no overtaking issues on the tideway next weekend, we will be pushing for a strong result there. M1: [Bow] Andre Thunot,  Tom Watson,  JT Baird,  Conor Burgess,  Fletcher Williams,  Neil Paul,  Craig Lambert, [Stroke] Paddy Buchanan, [Cox] Will Miller, [Coach] Chris Smith, [Boat] Adrian Cadbury. 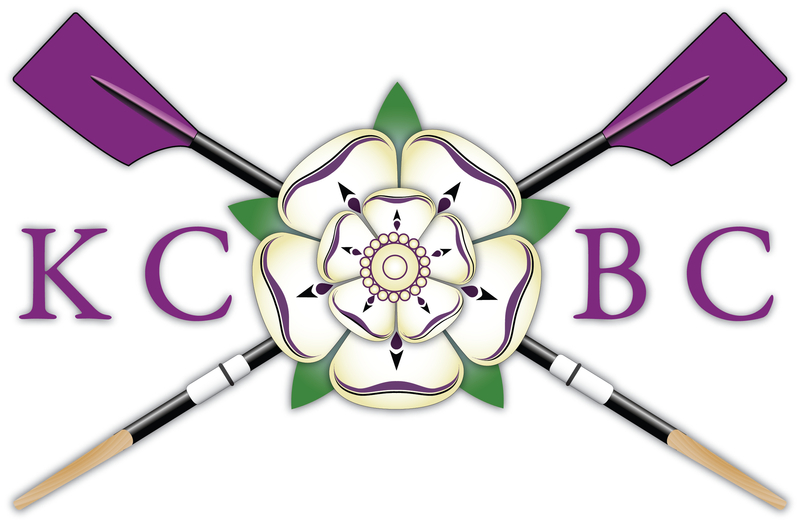 W1: [Bow] Nicoletta Knoble,  Viv Yang,  Ellie Archer,  Vanessa Tyler,  Kate Erin,  Marijne Mak,  Sophie Harrington, [Stroke] Ellie Re’em, [Cox] Phil Smith, [Sub] Felicity Eperon, [Coach] Roger Thorogood, [Boat] Leo Sharpston. We went into the final day of bumps knowing that, most likely, the Clare crew in front of us would bump out at some point along first post reach on a pedestrian Girton boat ahead of them so the plan was simple: hold off Robinson over the course and maybe have a go at an overbump… As with all things this week, it didn’t quite go to plan, but for once the luck was very much with us. Off the start it was as fast and lively as it had been all week, but like yesterday Clare had an absolute flyer of a start, again gaining their first whistles after we had taken 5 strokes! This didn’t trouble us though, as Robinson were being held on station behind us and not making the same inroads they had during the re-row earlier in the week. Up first post reach the situation remained the same, Clare closing fast on Girton and Robinson sitting just under 1.5 lengths behind us. First post corner changed everything though – Clare decided to take an aggressively tight line around it resulting in their bowside having to try to row through the bank, and gifting back the advantage they had pulled out during the first part of the race. Will told us what had happened, and the response from the crew was electrifying, really moving on a Clare boat which had seen their bump or bust tactic backfire on them today. In the end, we closed the 2 length advantage they had over us in less than a minute as Will’s perfect lines around the corners showed the Clare cox how to do it, with them conceding the bump on grassy corner, in front of all the supporters who had come down to cheer us on. Despite a week where luck and umpiring calls seem to have gone against us, we have been involved in some of the most exciting bumps racing I have ever seen this week and up 2 is still something to be proud of. A mention must also go to Robinson who we battled hard with all week and who pushed us onto the bumps in front! 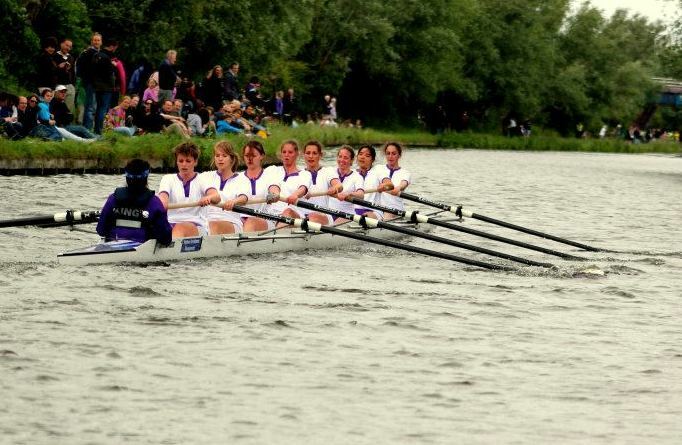 W1 spirits were not shattered as we rowed down to the start line. It was tense… we were minutes from either spooning or a bump to regain some dignity. The canon went with an epic start getting three whistles on Peterhouse before the motorway bridge But as the week has proved to us the out flow is our enemy. The whistles died down and the obnoxious mass of pink started to encroach and alas we were bumped. 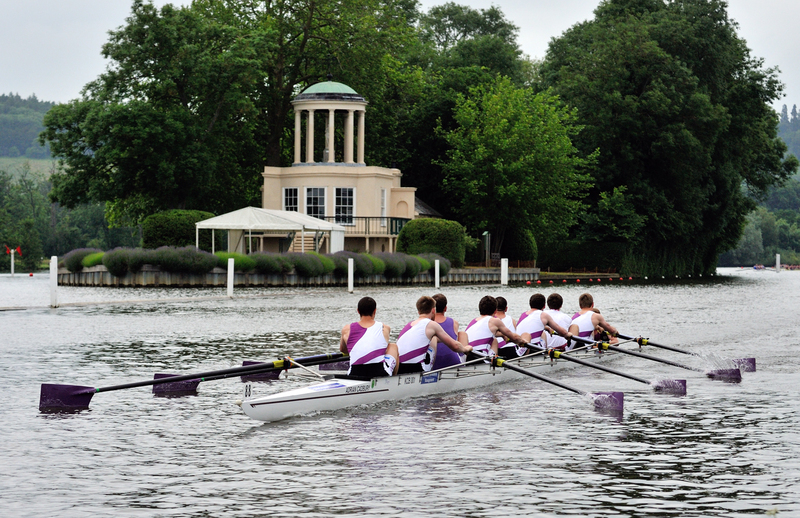 But we are proud of our achievement of being just a little bit rubbish and held our heads high with the knowledge that if bumps were but 500 metres on calm water, Kings W1 would be Head of the River.